Moruisg is a steep sided mountain with easier slopes near the summit. Its craggy W slopes form the E wall of Coire Toll nam Bian, with the col at the head of the corrie leading to Sgurr nam Ceannaichean. NW from the summit the easy to moderate slopes facilitate ascent from Glen Carron. NE of the summit there are steep slopes down to a boggy plateau. S of the summit the slopes are initially gentle then fall steeply, yet there is path on this slope down to Glenuaig Lodge where a track returns to Glen Carron. The formidable West face of Moruisg. Moruisg from the West. 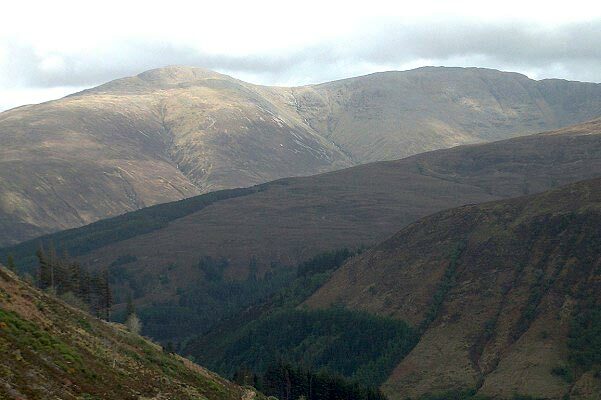 Seen across Glen Carron from above Achnashellach whilst ascending the path to Coire Lair. 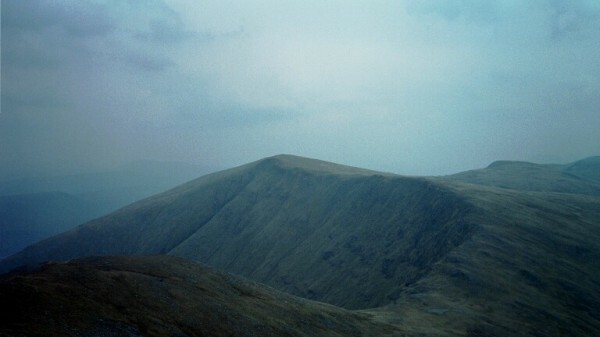 View of Moruisg from ridge linking it to Sgurr nan Ceannaichean. 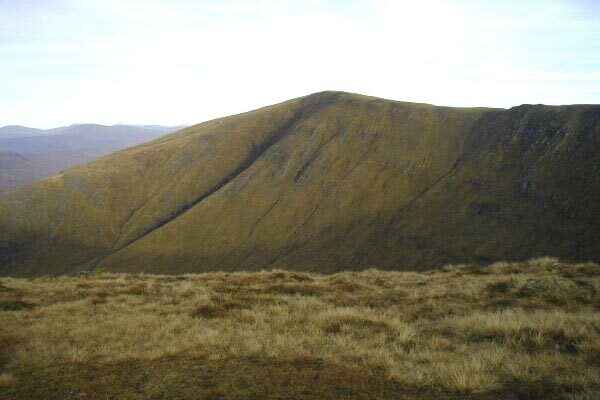 From the North ridge of Sgurr nan Creannaichean showing large cleft. 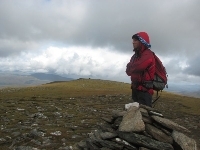 The summary information of one or more ascent routes that include Moruisg. 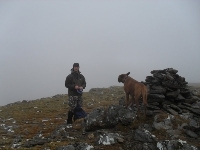 Karl and my Boxer on summit,(31/10/10). Moruisg summit on 28th august 2009 just cleared for us! Post a few words about Moruisg or read what others have had to say. The deer fence is well and truly established at May 2016. The bridge is fine and the way to the gate in the fence is clear, though continuously boggy. There is a path becoming established at the left of the burn ahead of you. This is helpful. Even more helpful is a big cairn at the northern end of the ridge which is the marker for you to descend should you want to return this way. 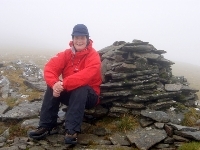 But it would be a shame to miss out Sgurr Nan Ceannaichean. 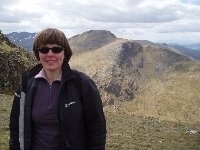 The views to the larger and distant Munros behind are magnificent. As at May 2012, there's an extensive deer fence being constructed just beyond the tunnel under the bridge. When we were there, a faded sign said that walkers should follow a line of (temporary-looking) red & white taped markers up the hill until the top gate comes into view. There is a developing path - no idea if it's the same route as before, as this was my first visit to the hill - so it might eventually be more obvious once the trees are planted. Our weather was fine, so the way was clear enough. Oh, and the gates hadn't quite been built anyway, so it was largely irrelevant! The bridge has now been completey rebuilt. Concern is shown regarding the bridge crossing of the Carron. There are now 3 scaffold planks & 3 railway sleepers in place across the iron girders which make the crossing that much easier. Our group went to climb this mountain last week (11/7/02). On arriving at the bridge over the Carron, we discovered that the "bridge" consists of 3 iron girders and no planks. It's not advisable to try to cross on a windy day. 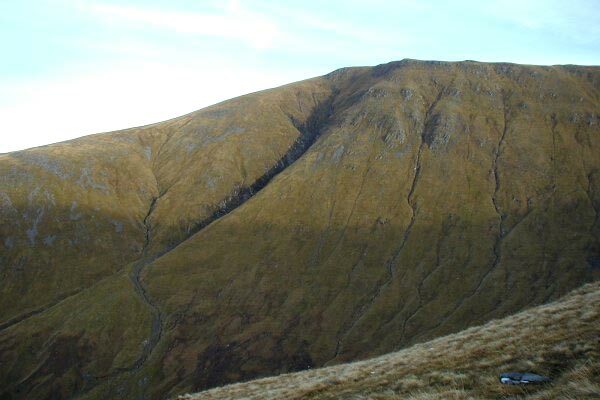 Alternate route is from Craig up the forest track to the stalkers path, which zigzags up the south side of Sgurr nan Ceannaichean and on to Moruisg.